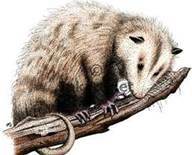 The opossum problem I wrote about last week has finally been resolved. We caught the mamma last Friday night and each night since we have caught one of her litter. Finally, last night, after setting traps every night, the trap was empty for the second night in a row. So, I think we’ve caught and relocated all of the juvenile youngins – 6 in all. Because of the attack and the uncertainty over whether or not the remaining meat chickens have been exposed to rabies they were destroyed. An expensive loss for our small homestead, but a necessary one. No sense in taking any chances. Another mystery has also been solved. From the first night we caught the mamma opossum our egg production has gone up. After not getting any eggs for weeks and thinking my girls were too old and needed to be replaced we are now getting 5 to 6 eggs a days. A pleasant turn about. Plans are in the making for another batch of meat birds and new ideas for more secure meat bird housing is also in the works. So – come September we’ll be back in the chicken business, and none too soon either. The freezer is getting a little thin where poultry is concerned.